I can remember tasting these bars for the first time about 15 years ago. It’s funny to think how long ago that was. My best girlfriends and I would grab the most sugary coffees at Starbucks and loads of treats at Christmastime before heading to church. There was this youth group for college kids we attended, and it felt so cool to have a peppermint mocha and a cranberry bliss bar in hand. Fast forward all these years, and Starbucks is still cranking out these lovely treats. I had one for the first time in years last week, and I noticed that the recipe I loved so long ago seemed to have changed a bit. I recalled them being much more moist and having a bigger hit of citrus. I understand that times, ingredients, memories, and tastes change but I really wanted that slightly gooier treat I so enjoyed in my youth group days. 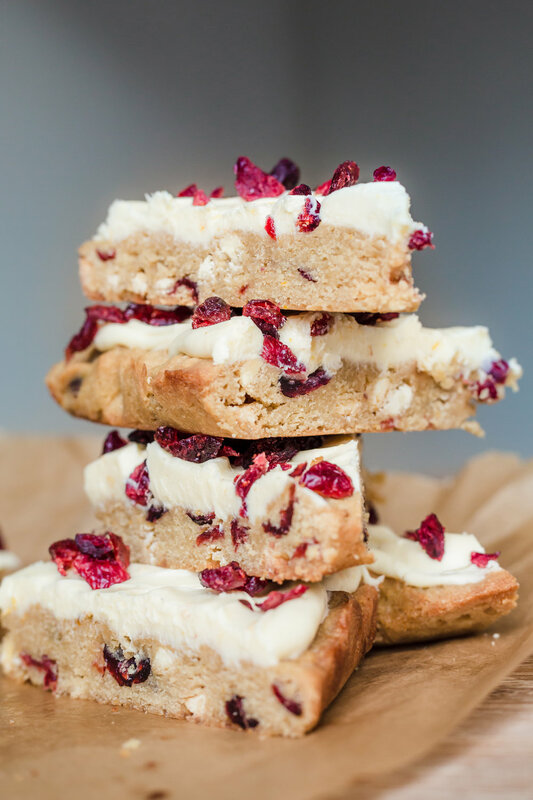 I set out to make this cookie bar by reading at least 15 recipes online until I settled on elements from each to create a bar that doesn’t disappoint and packs way more flavor than the average cookie. I always add salt and vanilla to ALL my baked goods. I notice they are missing from so many standard recipes online, and it’ll seriously pump up the flavor of anything you are baking. In the bowl of your stand mixer or by hand, cream butter and sugar until well mixed. Add eggs one at a time and only mix until each egg is just incorporated. Add vanilla, salt, and extracts to the wet mixture. Mix just a few turns. Add dry ingredients and mix until it’s all just incorporated. Spread batter into a lined 9 by 13 baking dish and bake at 350° for 18-22 minutes until cookie bar is just set. Over-baking will result in a dryer bar, and you want these moist and delicious. Remove from oven and allow to cool completely before frosting. To make icing, melt white chocolate in 30 second bursts in the microwave or over a double boiler. It should be completely melted but not overly hot. Mix soft cream cheese with a mixer (hand mixer or stand mixer). 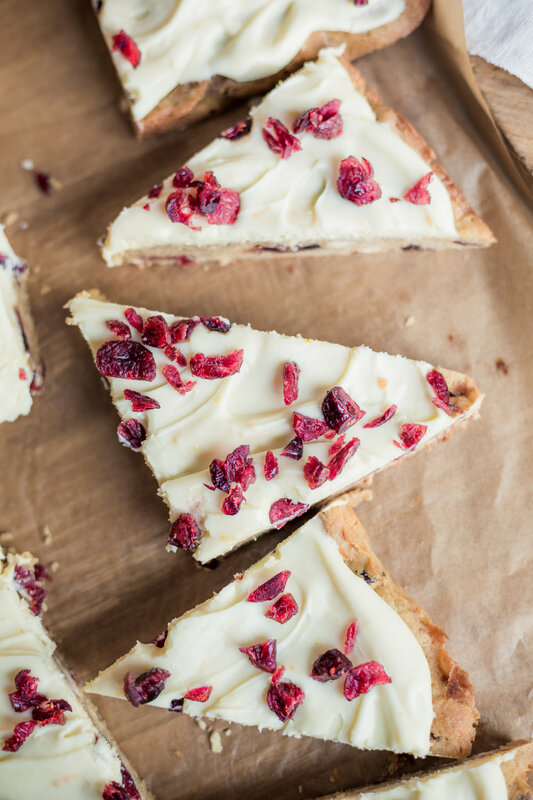 Slowly pour melted white chocolate into cream cheese. Add pinch of salt and orange zest. Scrape down the sides of the bowl and mix until smooth with no lumps. 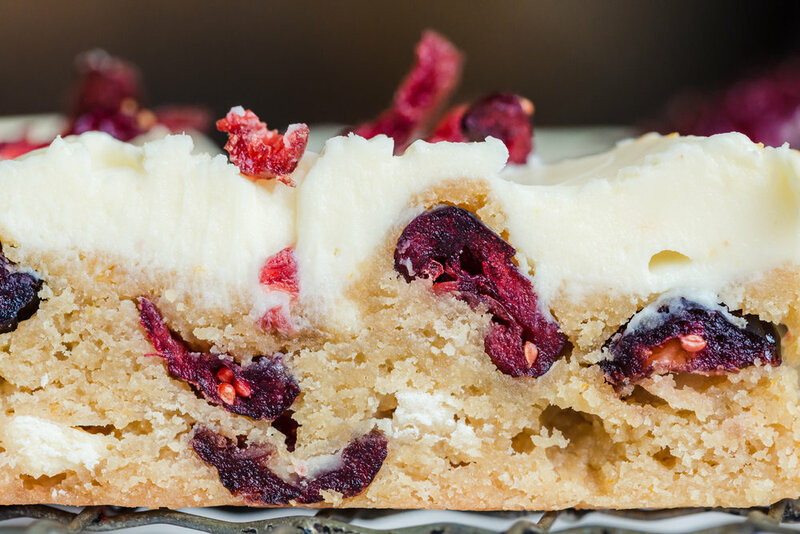 Spoon icing onto cooled cookie bars and sprinkle with chopped cranberries. Refrigerate the bars for 10 minutes to set icing. Slice and enjoy!